This device (Cat. no L02016) has been discontinued. The corresponding consumables (Cat. no L02017, L02011, L02012) are still available. GenScript is now offering the new and upgraded eStain L1 Protein Staining device (Cat. no L00657). Please click here to learn more about eStain L1. The eStain® 2.0 Protein Staining System, applying GenScript's patent-pending electric staining technology (Figure 1), enables you to quickly, reliably and efficiently stain protein gels with Coomassie blue dye within 7 minutes or less. As a user-friendly unit, the eStain® 2.0 Protein Staining Device uses disposable eStain® 2.0 Protein Staining Pads containing Coomassie blue dye in proprietary electrode buffers, offering easy and convenient procedures without the need for additional buffers. Figure 1. How eStain® 2.0 electric staining works. A certain voltage is applied to the graphite anode and titanium cathode of the eStain® 2.0 Device, driving negatively charged Coomassie blue dye reagents into the gel matrix between the eStain® Pads to stain the proteins and the free staining reagents out of the gel matrix to destain the gel. The eStain® 2.0 Protein Staining System combines three steps of traditional Coomassie blue staining method into one single step to greatly reduce the time required for protein staining (Table 1). The protein gel staining is finished so fast that you can see the staining results immediately after electrophoresis. Note: Competitor 3 also uses a microwave protocol which takes 15 to 30 minutes but often gives high blue background and requires extended destaining. In addition to ease and convenience, the eStain® 2.0 Protein Staining System provides high detection sensitivity comparable to that of traditional tri-step method (Figure 2). In the end, you'll see sharp protein bands out of clear background. Figure 2. High staining efficiency achieved using the eStain® 2.0 System. 7 ul New England Biolabs® Protein Ladder (P7703S) were loaded in each lane and separated on 4-20% Express PAGE Gels (Bis-Tris gel). The gels were stained either by eStain® 2.0 System (L) or by traditional Coomassie blue staining method (R) with CBB R-250. The eStain® 2.0 Protein Staining System is created as a self-contained system. The ready-to-use eStain® Protein Staining Pads contain the required electrode buffers with Coomassie blue dye incorporated in the cathode buffer. No additional solutions and buffers are required. Furthermore, the proprietary formulation does not contain methanol, therefore, the used eStain® Pads need no special treatment before disposal. With eStain® 2.0 System, all you need to do is to simply assemble the eStain® Pads together with the pre-run gel, then press the run button (Figure 3). Figure 3. Schematic workflow of eStain® 2.0 Protein Staining System. The eStain® 2.0 Protein Staining System is designed to work with multiple types of mini polyacrylamide gels, including Tris-Glycine, Bis-Tris, Tris-Tricine, and Tris-Acetate gels, etc. What's the difference between eStain® 2.0 Protein Staining System and original eStain® System? What's the difference between eStain® 2.0 Protein Staining System and conventional Coomassie blue staining methods? What's the difference between eStain® Protein Staining Pads R-250 and G-250? Can the eStain® Protein Staining Pads be used on blotting device to stain protein gels? Is eStain® 2.0 Protein Staining System compatible with mass spectrometry and 2D electrophoresis? Can I stain very thin (less than 1 mm) or very thick (more than 1 mm) gels using eStain® 2.0 Protein Staining System? What is the recommended temperature for using eStain® 2.0 Protein Staining System? A: eStain® 2.0 Protein Staining System is the upgrade product of original eStain® 1.0 System. The eStain® 2.0 Protein Staining Device is a totally redesigned electric staining unit. The stylish and durable design delivers a more user-friendly unit with extended service life. A larger LCD screen on the control panel clearly displays all the parameters. A waste tray is added to the right side of eStain® 2.0 Device to collect liquid waste and simplify the cleanup. The optimized circuit and control program increase reliability and reproducibility. The eStain® 2.0 Device uses a new eStain® 2.0 Graphite Electrode (L02017) which cannot be used on original eStain®1.0 Device. The eStain® Protein Staining Pads (R-250, L02011 and G250, L02012) are compatible with both eStain® 2.0 System and original eStainTM1.0 System . 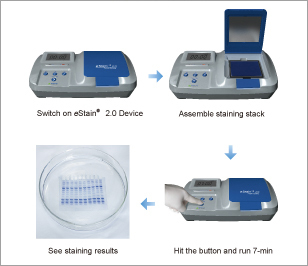 Why should I use eStain® 2.0 Protein Staining System? A: The eStain® 2.0 Protein Staining System is an innovation in protein electrophoresis analysis. It is designed to quickly, easily and reliably perform protein gel staining with Coomassie blue dye within 7 minutes or less. This system can greatly shorten your workflow and save your valuable research time for subsequent analysis. A: Conventional Coomassie blue staining methods rely on Brownian motion and require three steps including fixing (or washing), staining and de-staining (or washing), which results in a long and tedious process. The eStain® 2.0 Protein Staining System applies GenScript's proprietary electric staining technology. A certain definite voltage is applied to the graphite anode and titanium cathode to drive the negatively charged Coomassie blue dye into the gel matrix to stain the proteins and to push the unbound Coomassie blue dye out of the gel matrix to destain the gel. The eStain® 2.0 System integrates the three steps into a single step and significantly reduces the time required for protein staining analysis. A: The eStain® Protein Staining Pads are the consumable part of eStain® 2.0 System. Each pack of eStain® Protein Staining Pad contains an eStain® Cathode Pad presoaked with proprietary cathode buffer with CBB dye R-250 or G-250 incorporated, and an eStain® Anode Pad presoaked with proprietary anode buffer. 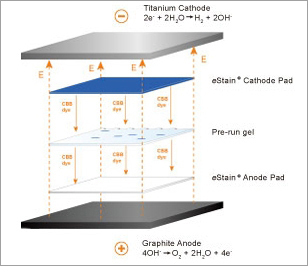 Similar to semi-dry blotting, the eStain® Cathode Pad and eStain® Anode Pad act as ion reservoirs and the eStain® Cathode Pad also supplies negatively charged CBB dye for protein staining. A: The eStain® Pads (R-250) have incorporated Coomassie blue dye R-250 and make dark blue protein bands. The eStain® Pads (G-250) have incorporated Coomassie blue dye G-250 and deliver bright blue protein bands. Customers can select R-250 or G-250 eStain® Pads according to their color preference. A: No. For best results, one pack of eStain® Protein Staining Pad is used to stain one gel. Discard used eStain® Pad after each staining. A: No. The eStain® Protein Staining Pads are designed to work with eStain® 1.0 and eStain® 2.0 Protein Staining Devices. If they are used on blotting device, we can't guarantee satisfactory staining results. A: During the electric staining process, the eStain® 2.0 Graphite Electrode will absorb ions from the anode pad while losing carbon composition, which will change the conductivity of the graphite electrode, thereby affecting the staining results. For best staining results, after 100 uses, the worn eStain® 2.0 Graphite Electrode should be replaced with a new one; the graphite electrode should also be replaced when staining performance is significantly reduced. A: The eStain® 2.0 Protein Staining System is designed to work with multiple homemade or precast mini polycrylamide gels, including Tris-Glycine, Bis-Tris, Tris-Acetate and Tris-Tricine gels, etc. For specially formulated gels, optimization of the staining time may be needed for best results. A: Using eStain® 2.0 Protein Staining System, one gel can be stained for each run. A: The eStain® 2.0 System utilizes Coomassie blue dye R-250 and G-250 as staining reagents. They have similar detection sensitivity down to dozens of ng per protein band. A: Yes. It is compatible with mass spectrometry and 2D electrophoresis just like conventional Coommassie blue staining methods. A: No. To ensure optimum Western blot results, unstained gels should be used. A: Yes. However, the staining time needs to be optimized. For example, 6 -7 minutes are needed to stain a 0.75 mm mini gel and 8-9 minutes are needed to stain a 1.5 mm mini gel. A: For best staining results, it is recommended to use eStain® 2.0 Protein Staining System at room temperature (22 - 28 ℃). If temperature is below 22 ℃, users may need to extend the running time to obtain satisfied staining results based on gel thickness. A: A tiny crack may develop at one of the two lower corners next to the titanium cathode due to thermal expansion difference between the lid material and the titanium cathode. However, it does not affect the staining performance of the device. A: No. It will DAMAGE the device due to short circuit. We have placed a warning sign on the lid of eStain and the cover page of the User Manual. It is hard to close the lid or the lid can't be closed tightly. 1. The lid is not closed properly. 2. Extra Sponge Cushions are placed in the anode tank. 1. Follow the instruction on Page 14 in the Manual to properly close the lid (figure 1). 2. Use 1 piece of Sponge Cushion when staining 1.5 mm gel; use 2 pieces of Sponge Cushion when staining 0.75 and 1 mm gel. The stained gel has hazy blue spots. The gel has not been destained sufficiently. Invert the eStain® Cathode Pad, cover it back on top of the gel. Perform electric staining for 1 or 2 more minutes (figure2). Blue spots observed at the bottom of the stained gel. 2. The eStain® 2.0 Graphite Electrode is installed in wrong direction. 1. Fix the spring on the contact rod located close to the triangle symbols. 2. Follow the steps described on Page18 in the Manual to install the eStain® 2.0 Graphite Electrode in correct direction (figure 3). Ring-like spots observed on the protein bands. 1. Air bubbles trapped in the assembled staining stack. 2. Small gel pieces attached on the surface of the gel. 1. Use the small shovel supplied with eStain® 2.0 Device to press air bubbles out of the staining stack assembly. 2. Make sure to remove all the gel pieces by washing the gel in distilled water prior to staining. The stained gel has very faint or nearly invisible protein bands with high blue background. 1. The staining time is not long enough. 2. The graphite electrode has been used for over 100 times. 1. Cover the gel with eStain® Cathode Pad again and then perform electric staining for 1 or 2 more minutes. 2. Replace the worn graphite electrode with a new one. The stained gel has very faint or nearly invisible protein bands with clear background. Do Not stain the gel using eStain® 2.0 System again. Instead, stain the gel using traditional tri-step method. Excessive current is flowing through the device. Check if the staining stack is properly assembled and ensure full coverage of the gel. Incomplete electric circuit due to improper assembly of the staining pads. Ensure the staining stack is assembled correctly: use the eStain® Anode Pad first followed by the gel, and the eStain® Cathode Pad.